PORT MORESBY: Electoral Commissioner Patilias Gamato has come again under fire from the Opposition about the ownership of the Indonesian printing company engaged to print election ballot papers. 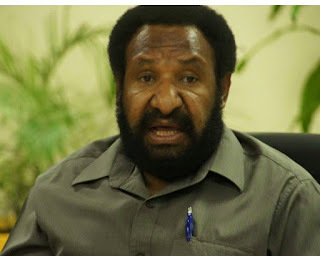 This time its leader Don Pomb Polye calling on Gamato to reveal more facts about the ownership of the Pura Group which is responsible for the printing. Mr Polye said there was more to the printing deal than what meets the eye. “I ask Mr Gamato to continue to reveal who owns the PNG agent company of the ballot papers printing in Indonesia. “I have reliable information that the agent is owned by an MP who is aligned to the Prime Minister Peter O’Neill’s PNC party,” said Polye. He added what he said about printing ballot papers overseas, especially Indonesia was TRUE as confirmed by Gamato, asking the Electoral Commissioner to reveal more truth in response to his allegations in his statement. “His admission of the printing of ballot papers in Indonesia only proves my point that the rigging of 2017 National Election has just begun. The Electoral Commission has already facilitated it for the PNC party to remain in power!